The Breakdown: An Unconstitutional Mandate? Fourteen states have filed suit challenging the healthcare overhaul, particularly the individual mandate, as unconstitutional. Christopher Hayes asks Columbia law professor Gillian Metzger whether this argument holds up. Late Sunday night, after a full day of raucous floor debate, the House of Representatives voted to pass a (nearly) finalized version of healthcare reform. On Tuesday, President Obama signed the legislation amidst fanfare, relief and a pitch-perfect obscenity, compliments of the vice president. Since its passage, opponents have been finding all possible avenues to obstruct, delay and derail the newly instated law. Many of these attempts are farcical, but one in particular seems to be gaining traction amongst conservative scholars and lawmakers. As of Thursday, attorneys general from fourteen states have filed suit challenging the healthcare overhaul, particularly the provision known as the individual mandate, as unconstitutional. While the argument has certainly stirred rhetorical fervor, the question remains, does it hold up legally? 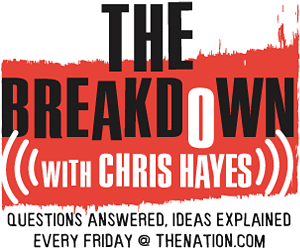 To answer, this week’s The Breakdown With Chris Hayes invites Columbia law professor Gillian Metzger to examine the validity of the constitutionality argument. Go here to read the full transcript of this episode of The Breakdown. The American Constitution Society provides an in-depth issue brief on the subject. Yale Professor Jack Balkin makes an argument for the constitutionality of the individual mandate in The New England Journal of Medicine. Former DOJ Lawyers (under Reagan and George H.W. Bush) provide the legal framework for a constitutional challenge. Ezra Klein explains the individual mandate.